Fraser Island’s actual name is k’Gari. It is the largest sand island in the world and one of the most beautiful places as well. There is nowhere like it in the world where you have sand dunes reaching out into the sea, tropical rain forest in the middle and crystal clear lakes all over. We set up camp on the Friday morning and enjoyed an afternoon inland at Central Station, where a creek runs through the rain forest and it doesn’t even look like there is water in it, that’s how clear it is. We then headed to Lake Mackenzie for a swim. It’s a stunning lake and the clear waters and white silica sands are spectacular. And the water wasn’t too cold either. Saturday morning and club leaders were collecting bags from us after registering. We then had a lunch at Yidney Rocks. 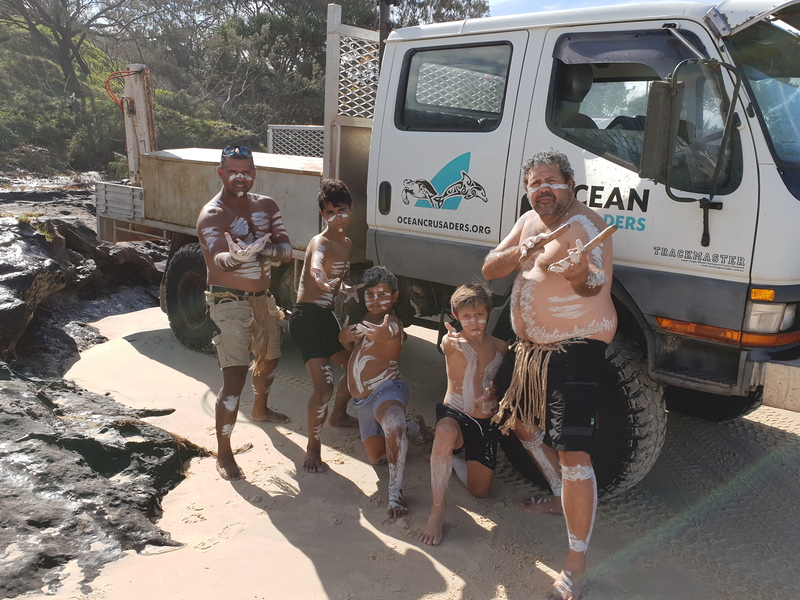 The Butchulla People were to conduct a welcome to country ceremony and I met them on the beach where everyone was parking their cars. I was keen to get a photo of them. I was really happy when I spoke with them and one of the young boys asked me if I knew the story of how Double Island Point was formed. I didn’t so he reeled off the traditional dreamtime story. It was fascinating and I won’t repeat it here as I can’t do it justice. It was awesome to see the next generation knowing their heritage. You can watch the welcome to country on our Facebook Page here. Sunday is cleaning day for the clubs and they start early. We had two skip bins to cover the beach, one near our campsite at Cornwells and one up at Dundabura. Mark, Maura and Mike headed north to man the Dundabura site with two awesome volunteers from Drop Bear Adventures who were helping us out with the sorting. The rest of us stayed at Cornwells. Annika got stuck into the sorting table with the rubbish the Drop Bear crew had picked up the day prior whilst Andy from 4WD Queensland and I weighed bags arriving from the clean up. Some amazing sights were appearing, none better than a bright red Jeep covered in bags and rubbish. No racks, no trailer, no worries for Vanessa from All American Wheeling. The speed of bags arriving increased and we sere struggling to keep up with the flow. The sorting team were powering on as well with some interesting stats coming out straight away. More on that later. 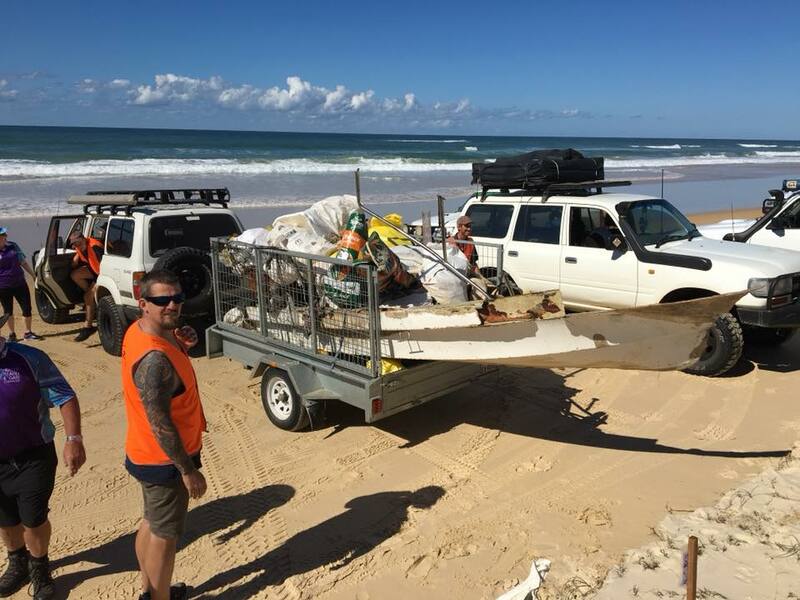 Some of the other highlights included half a boat that had been washed up collected by the North Brisbane 4WD club, an excavator track found by Fraser Coast 4×4 Club, Brisbane 4×4 Club pulled in a 180kg ships tow line, and the Mitusbishi club pulled in over 110 bags of rubbish. The amount of debris was simply staggering and the skip bins filled up far too quickly. With Mike having to leave for work commitments on Monday morning, we filled the OC truck to the brim with recycling. We couldn’t fit any more on. If we had thrown that in the skip bins like usual, we would’ve had major issues fitting everything. By late in the afternoon we had weighed everything and were a little over half way through the sort. We asked for more bins and they delivered 4 more hopper bins, only for us to fill them too. We still had debris that needed bins so they squashed the big skip bin near us so we could fit more in, only for us to fill it again, still needing more. The evenings presentation gave us a chance to thank everyone for their amazing efforts. 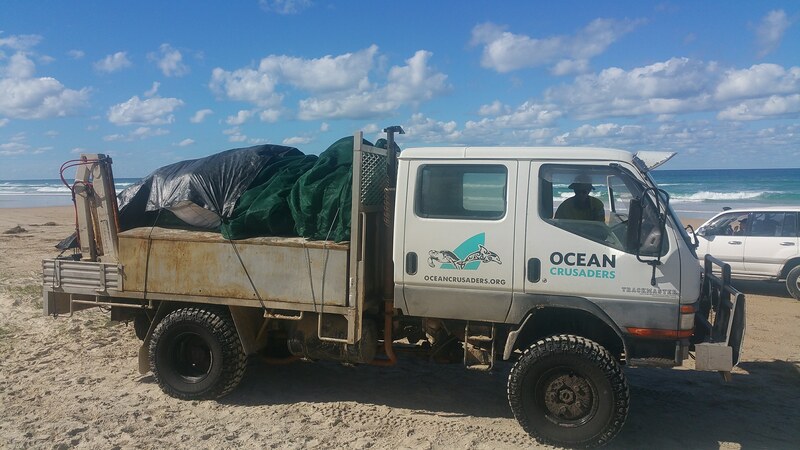 We announced a figure of just over 6 tonne of debris, still knowing there were bags needing pick up from some areas of the beach in the morning. 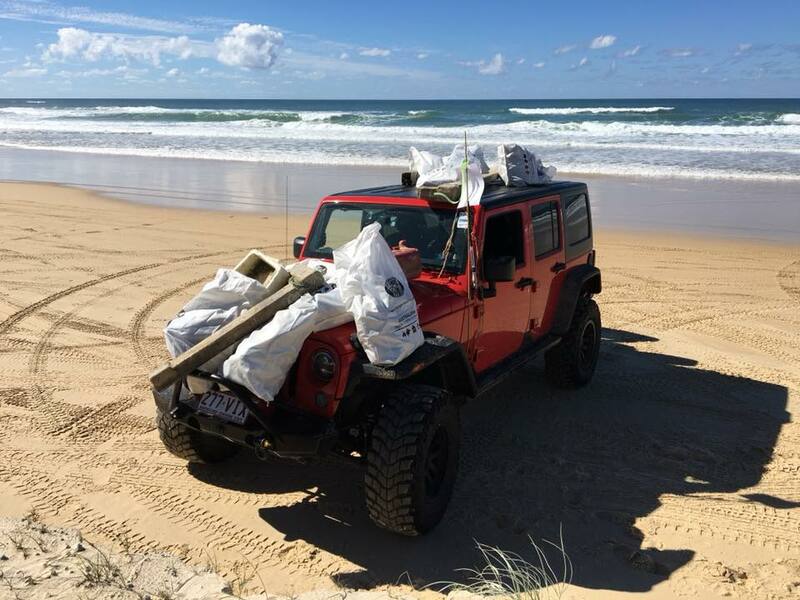 With the help of North Coast 4wd Club and their truck, Mark finished off the pick up and the final weigh in saw a staggering 6,974 kg of debris that had been removed. The reason we do the data analysis is to find out what it is we are picking up and where it is coming from. 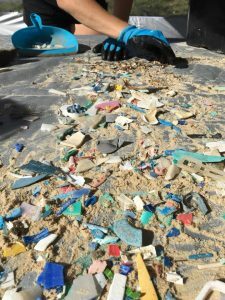 It is all part of the Australian Marine Debris Initiative database that Tangaroa Blue run. We need data to prove to the councils, governments and other policy makers of what we are finding. It also allows us to find out where it is coming from. For instance we picked up 2 bags of foreign bottles. When we posted the stats on facebook everyone was blaming the Asia Pacific nations for all the rubbish, however we have to look deeper and find that 2 bags from 888 bags, well that is not a lot of rubbish as a percentage. In fact we believe that 20% of the debris probably comes from island users, 10% from ships or overseas and the remaining 70% would be attributed to wash out from Australian communities on the mainland. It brings up a valid point, we need to fix our own issues before we blame others. We as a nation need to clean up our act first and foremost. The most alarming find was 1,723 Cyalume Sticks used by fishermen to light up buoys and nets at night and by beach partyers. And the most satisfying statistic is the removal of 131,350 pieces of hard plastic. These are, or will become, the small bits that are dangerous to our wildlife. 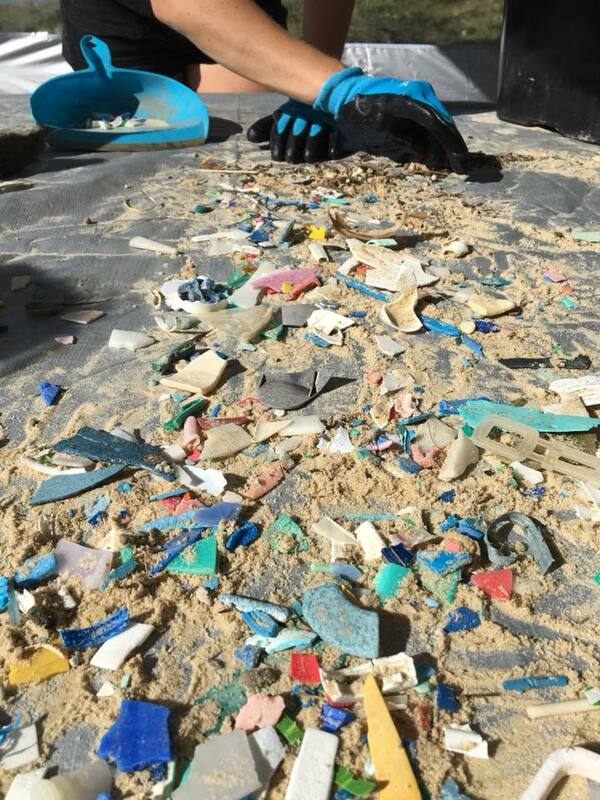 80% of the rubbish was plastic, the majority of it could be recycled with the right facilities. 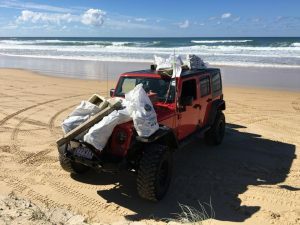 4WD Queensland Association do an amazing job and it was awesome to be involved and get this data. The response from the data has also been amazing with over 60,000 views of it on Facebook and lots of calls to us about it. Hence we have created the interest we had hoped and with this data we can now set about change. That change starts with you. Let’s not look at other people and what they are doing, let’s look at ourselves right now and see what we can do better. We need to then set an example for others to follow. Don’t be discouraged by the minority that will never change, just do your best by saying no to plastic packaging whenever possible. Take the extra time, spend that little bit more, do whatever it takes to change your plastic habits as we can all do better, us included. We need to in order to look after places like Fraser and our oceans. 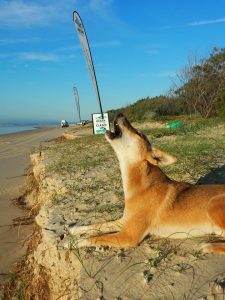 The dingoes that live on the island, the turtles that nest on the beaches and the birdlife that feed on the high tide line, need our help and that starts now. What you do today, will effect tomorrow. It was however fantastic to drive off the island on Monday afternoon and seeing little to no rubbish. Every tide brings in more rubbish but we had made a massive difference and we will be back next year to do it all over again.